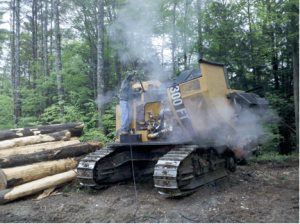 If your machine is in need of service, give us a call (1-800-422-2332). Our capable service technicians may be able to help you solve the problem over the phone. If it requires a more in-depth look, we provide in-shop or on-site service to help minimize down time, maximize your productivity and your machine’s life. All service technicians are factory trained and certified providing you with prompt service done right the first time. Our service trucks are fully stocked with parts and accessories for your convenience. With our knowledgeable service staff, we can solve your problem fast! If you’re located anywhere in the six New England States you’ve got to take advantage of our FREE on-site equipment demonstrations. We’ve found that one of the most effective ways to make a buying decision is to see our equipment at work at your own location, washing your own trucks or equipment. This takes all the guess work out of the purchase process, and allows you to see first hand what our Power Eagle equipment can do, and which model is right for your needs. Our experienced salesman will arrive at your location in a fully equipped box truck carrying a job-matched selection of new pressure washers, detergents and accessories ready for you to try. Bring us your filthiest piece of equipment and we’ll show you the fastest and easiest way to make it clean. You choose: Our shop or yours. For your convenience, we offer Pressure Washer service, maintenance, and repair. We work both at your shop and ours. For in-shop repair, simply drop off your equipment and we’ll get you back up and running fast. For customers located within the six New England states we offer direct on-site maintenance for your pressure washing equipment. 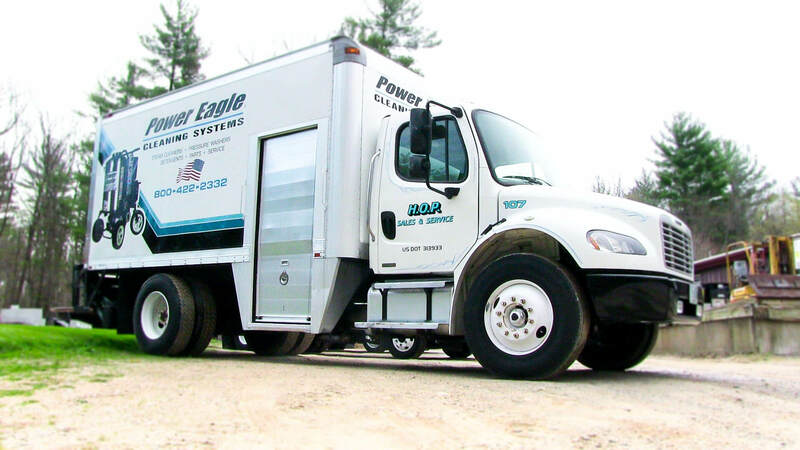 Our fleet of fully stocked service trucks are dispatched throughout New England daily. Each truck is manned by a factory trained professional whose sole purpose it is to get your equipment running properly. Our goal: Get there fast, fix it right & let you get back to work. For customers out of the New England area, service is available through our network of industry professionals across the country. Please contact us for a service center near you. Does your company utilize a moderate to high volume of detergent each month? Our bulk detergent program, with auto-delivery, provides several advantages over purchasing drums or pails. We provide a tank free of charge and regularly fill it with our metered bulk detergent delivery truck. Never run out of detergent. Our detergent delivery truck will automatically be dispatched to your location based on your product consumption so that you’ll never be empty, and you’ll never have to call us… its automatic. Buy at the lowest possible price per gallon. When you’re part of our bulk detergent program, you will significantly reduce your cost per gallon compared to drums, saving your company big money. If you wish, we can install a TAMPERPROOF metering control for your pressure washer detergent injector. This way YOU control the rate of soap usage, avoiding unauthorized changes to soap dilution rates. With our bulk detergent program you’ll eliminate the clutter of all those empty detergent drums around the shop and yard. Free “quick check” of your pressure washing system. While we’re filling your detergent tank, we’ll run the pressure washer to make sure everything is OK. You’ll be notified of any potential service issues, and if you wish, repair can then be scheduled. These free “quick checks” will ensure that no small problems turn into big ones. 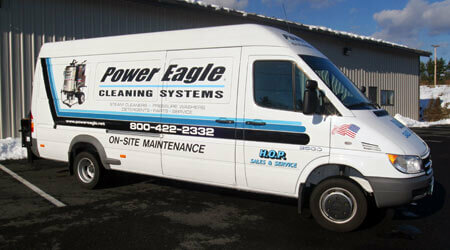 We want to exceed your expectations with our Pressure Washer service, maintenance, and repair.